Despite very considerable evidence that the economy of Sudan is collapsing under the weight of numerous unsustainable pressures, there is no full extant account of these pressures at this critical moment in the political history of Sudan. Understanding the human and political consequences of economic collapse in Sudan is also critical in making sense of the future of now independent South Sudan. Nominally tasked with monitoring the Sudanese economy, the International Monetary Fund (IMF), and to a lesser degree the World Bank, have failed to present a full or accurate picture—too often dancing around difficult issues and simply accepting at face value figures provided by the Government of Sudan. Every one of the eight key charts in the IMF's July 2014 report indicates as its source of data: "Sudanese authorities and staff estimates and projections." Most conspicuously, the two organizations have failed to provide anything approaching realistic figures concerning military and security expenditures. There is in the July 2014 IMF report not a single line item—not one—reflecting or indicating the scale of military and security expenditures. We may learn about "Regulatory capital to risk-weighted assets"; but we will learn nothing about investments in weapons acquisitions from abroad or the growing domestic armaments production. We learn nothing of salaries and logistical expenditures for the Sudan Armed Forces or the militias the government supports. Since the Government of Sudan—essentially the National Congress Party (formerly the National Islamic Front)—is deeply threatened by a fuller understanding of the dire straits in which the economy currently lies, it has an obvious interest in doing what it can to minimize popular understanding of growing economic threats, and in particular the excessive budgetary commitments to the Sudan Armed Forces, various security forces, and militias. Certainly there is no dearth of studies, statistics, or analyses of the economy (see Bibliography). But none does enough to assess the impact of Sudan's growing economic distress on various crises within Sudan itself and the region as a whole, most particularly in South Sudan. Continued serious fighting in Darfur, the Nuba Mountains of South Kordofan, and Blue Nile mean that the Government of Sudan is obliged to spend inordinate amounts of annual revenues on armaments, soldiers' salaries, logistics, and the security services that are an integral part of the military power wielded by the government. Estimates vary widely, but the consensus is that significantly more than fifty percent of budgetary expenditures are directed to the military and security services. Moreover, the oil revenues that fueled the decade of economic growth following the first oil exports (August 1999) are now only a fraction of what they have been. This augurs extreme difficulties in negotiating with South Sudan over final boundaries, since many of the contested areas—including Abyei—have significant oil reserves. In all the regions where fighting is occurring, agricultural production has declined precipitously, creating extraordinary ongoing humanitarian needs. The government has made provision of relief assistance impossible in the most affected areas of South Kordofan and Blue Nile, and for more than a decade has harassed, impeded, expelled, and threatened humanitarian organizations operating in Darfur, where security has become so bad that further withdrawals by organizations are inevitable. It is in the domestic political arena, however, that the economy is most worrisome for the NCP government. Inflation remains extremely high—and likely a good deal higher than suggested by the figures coming from the Central Bank of Sudan—and the Sudanese Pound continues a rapid decline in value against the dollar. There is exceedingly little foreign exchange currency (Forex), which has led to acute difficulties in financing imports of all kinds, even food and refined fuel for cooking (Sudan's refining capacity is not sufficient to meet very large demand). Bread shortages earlier in 2013 and 2014 were a direct result of a lack of Forex for purchases of wheat abroad, exacerbated by the increased cost to bakeries of cooking fuel. Looming over the entire economy is the massive external debt, which in August stood at US46.9 billion according to the IMF; the government can neither repay nor service this debt without reforms—economic and political—it has shown itself unwilling to make. Last September and October, there was a serious, sustained, and occasionally violent public uprising to protest the price increases resulting from the government's lifting of subsidies for fuel (including cooking fuel). The government response was swift and brutal, with "shoot to kill" orders in place from the beginning of the uprising according to Amnesty International. More than 200 demonstrators were shot to death, and many more wounded; some 800 people were arrested. The figures are likely much higher. Despite the normalcy of IMF accounts of Sudan's economy, there can be little doubt that it has reached the breaking point; and continued inflation, which may reach to hyperinflation, will—as it has before in Sudanese political history—be the economic force that brings down the government. The emergence of the National Consensus Forces as a coalition of smaller northern political parties committed to "regime change" is but one sign of growing determination to end the 25-year rule of the NIF/NCP. The "Paris Declaration" between the National Umma Party (NUP) and the Sudan Revolutionary Front (SRF) is another such sign. The NUP, led by Sadiq al-Mahdi, is one of the two traditional sectarian parties that have long had significant political support. The SRF is a coalition of armed rebel groups from Darfur, South Kordofan, and Blue Nile that is also committed to regime change, by force if necessary. The current Government of Sudan has no way to respond to both increasing political pressures and the consequences of a rapidly deteriorating economy. As a result, it will almost certainly resist change, with violent repression, for as long as possible; for many of its leaders have been or will be the subject of arrest warrants for crimes against humanity by the International Criminal Court, and will have no recourse or avenue of escape once the government falls. They are as a consequence especially dangerous, and the fall of the regime may well be very bloody. The international community should plan now how to assist in the creation of a democratic, inclusive, and secular Government of Sudan, and should be prepared to address some of the most immediate problems, including widespread food insecurity. 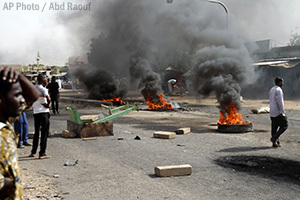 Photo: Protesters burn tires and close a highway north of Khartoum amid a wave of unrest over the lifting of fuel subsidies by the Sudanese government. (September 25, 2013).